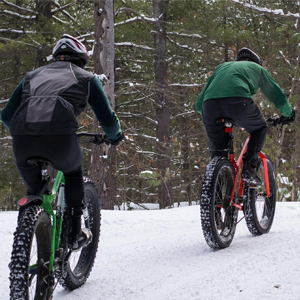 Get off the indoor trainer, layer up and head out for some seriously cool fat biking this winter in the great Canadian wilderness just north of Toronto. Head north from Toronto for 2.5 hrs and leave urban behind for the serenity of Ontario’s oldest provincial park. While well-known for its extensive summer offerings – including camping, paddling, hiking, and interpretive programming opportunities – Algonquin Park has a lot to brag about in the wintertime too, including over 85 kms of groomed cross-country ski trails, ice skating at Mew Lake Campground, and snowshoeing on interpretive walking trails. For cyclists however, look no further than the Old Railway Bike Trail. This 16 km route follows the old rail bed of the historic Ottawa, Arnprior, & Parry Sound Railway, opened in 1896 and decommissioned in 1959. 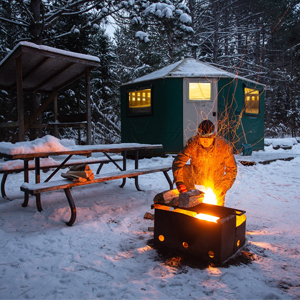 The trail is best accessed from Mew Lake Campground, which offers a heated comfort station for day-use visitors as well as year-round developed camping on designated sites, or in one of seven yurts available to rent. 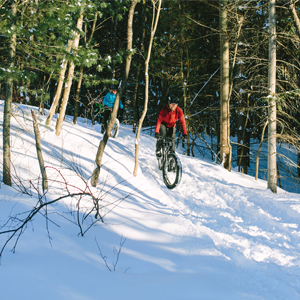 The Old Railway Bike Trail is groomed and track set for Nordic skiing, but is also a popular multi-use trail (provided those on fat bikes, snowshoes, or pulling toboggans don’t disturb the tracks set for skiers). The terrain on this trail is primarily level and smooth, making it the perfect first stop for novice riders or those looking for an easy transition between road cycling and this off road experience. For current trail conditions click here. Don’t have your own bike? Consider a rental from Algonquin Outfitters (which includes a helmet) or The Bike Shop (with their own onsite coffee bar to get your caffeine fix before you hit the trail). Stay overnight in a cozy yurt right in the park, opt for full service amenities close by at Deerhurst Resort, or enjoy the warm ambiance in your own log cabin with wood burning fireplaces (and homemade meals included!) at Cedar Grove Lodge. Have breakfast or lunch before heading into the park at The Moose Cafe in Dwight, and enjoy your dinner at one of the many fine establishments on the outskirts of the park in Huntsville, like 3 Guys And A Stove, Soul Sistas, or The Artisan House. If you fancy a craft brew while in Huntsville, don’t miss the newly-opened Huntsville Brewhouse, Lake of Bays Brewing Co‘s brew pub that’s located on the historic main street (and while you walk the downtown core, check out the stunning murals adorning local shops and restaurants that are part of The Group of Seven Outdoor Gallery). From Algonquin Park, head west on Hwy 60, across Aspdin Road towards Rosseau, Ontario and then continue north-west to Parry Sound. Depending on your timing, grab an espresso at Cottage Law Canteen or have an early lunch at Crossroads Restaurant while you pass through Rosseau. You’re en route to the Georgian Nordic Outdoor Activity Centre. Located just north of the town of Parry Sound, this spot is a mecca for outdoor enthusiasts in the winter months with over 30km of groomed trail systems in place for Nordic skiing, snowshoeing and fat biking on their 200 acre property. Plan your trip around an annual event, like Global Fat Biking Day (usually the first Saturday in December), and keep your eye on their Facebook page for other event announcements and trail condition updates as well. For rentals, the folks at Parry Sound Bikes or Trysport Parry Sound will hook you up (and if you need that coffee kick, Parry Sound Bikes has got you covered there too). When you’re ready to eat, treat yourself to casual fine dining at the Log Cabin Inn, grab some wood-fired and award-winning fare at Maurizio’s Pizzeria, or settle in to some home cooking at Trapper’s Choice Restaurant. If you’d like to add a local beer to the culinary portion of your day, stop by Trestle Brewing Company overlooking the CP Rail Trestle (dining options available at the brewery too). When you’re ready to rest your head, check out Grand Tappattoo Resort in Seguin. The resort features onsite dining at Forest Restaurant, an indoor pool with sauna to sooth your muscles after a day on the trails, and ice skating on Otter Lake (weather permitting). If you’d prefer to stay in town, try Bayside Inn, Parry Sound Inn & Suites, or the Comfort Inn. 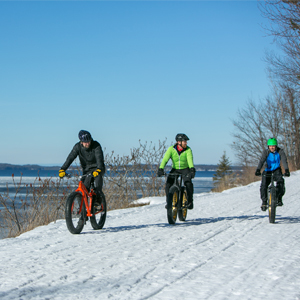 Day Three of your journey and you don’t need to travel far – there’s more fat biking to be had in Parry Sound! 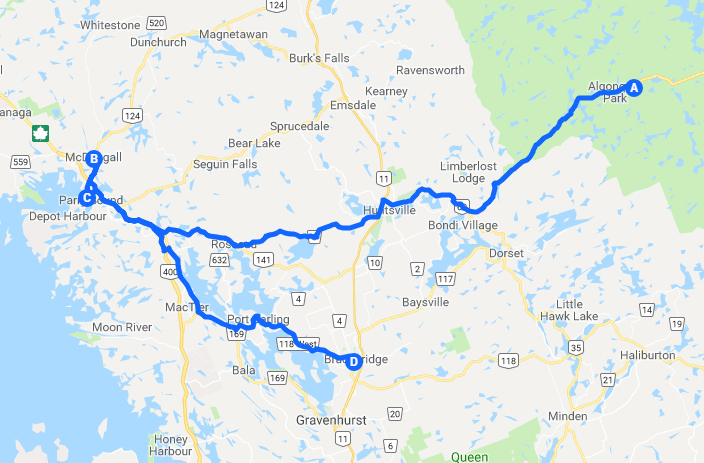 If you scored a rental with Parry Sound Bikes or Trysport Parry Sound, be sure to make it for two days to get the most of the riding in the region. For today’s excursion, you’ll hit the 6km Rotary and Algonquin Regiment Waterfront Fitness Trail, which travels along the waterfront of Georgian Bay, an absolutely stunning section of the UNESCO-designated Georgian Bay Biosphere Reserve and one of their Amazing Places. This trail was once a spur line for the CN and CP railroads, so you can expect generally level and even terrain. Grab a homemade lunch at Orr’s Fine Meats and Deli or treat yourself to some pub fare at Brunswick Sports Grill & Bar (for more dining options click here). Stay another night in Parry Sound, or make the journey towards Muskoka to start your next day of riding early in Bracebridge (consider Quality Inn Bracebridge; it’s right across the street from your Day 4 start location). Start your day with breakfast at Fresh Kutz Market & Grill or grab a specialty coffee downtown at Camp Muskoka Coffeehouse (where you can enjoy an indoor or outdoor fire as well). When you’re ready to ride, head over to Liv Outside on the Muskoka River. 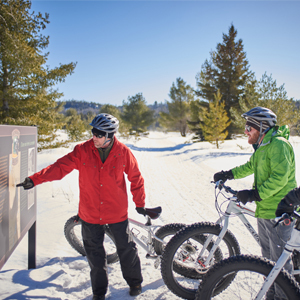 Fat bike rentals are available here (which include a helmet and road map to local trail systems), but you’ll want to get started at their own onsite Riverside Adventure Park Trails. Developed and maintained by the owner and staff of Liv Outside, the single track trails are meticulously groomed and scenic as they wind through the pine and hardwood forest of this Muskoka landscape. You can also book a guided trip if you’d like to have one if their knowledgeable staff take you through their trail system. When you’re ready to eat, there are lots of options in Bracebridge to suit every taste. Dine at the main street staple, The Old Station Restaurant, enjoy authentic Mexican dishes at El Pueblito, hand-rolled and super fresh sushi at Wabora (or make a reservation for the Teppanyaki table if you enjoy dinner and a show) or bask in BBQ glory at the Pasta Tree & Smokehouse. If you’ll be heading southbound towards home, consider an overnight stay in Gravenhurst at Four Ninety Muskoka or Robbins’ Tuktawayin B&B. Both are certified cycle-friendly businesses by Ontario By Bike and offer comfortable accommodations with a homemade breakfast included with your stay. To plan your stay in Ontario’s Cottage Country click here.